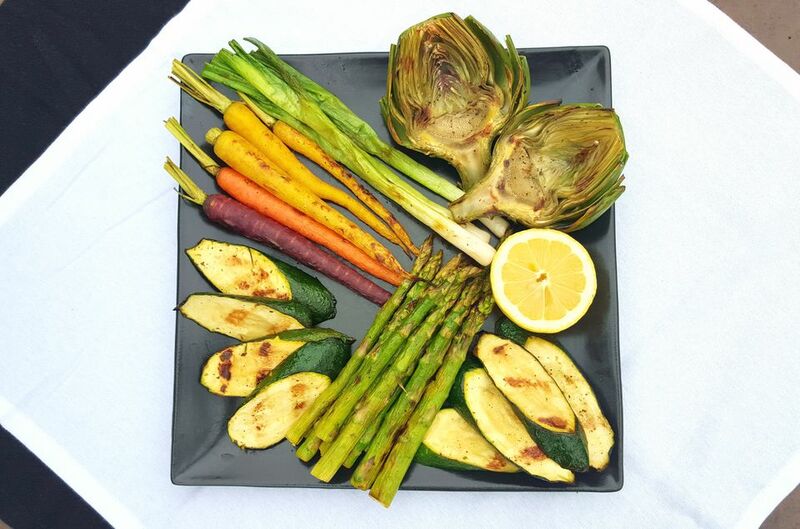 Grilled vegetables are always a favorite, but spring vegetables really kick off the barbecue and grilling season. These tender and delicious veggies are quickly marinated in a red wine vinegar mixture and cooked quickly on the grill. This dish makes a perfect side dish, but flavorful enough for the vegetarian or vegan in the group. Cut the bottoms off asparagus spears so that they are about 4 1/2 to 5 inches in length. Wash in cool water, pat dry with paper towels and set aside. Cut off any stems and greens from carrots and wash thoroughly. Pat dry and set aside. Wash spring onions, pat dry, trim tops about 1/4-inch and cut off about 1/2-inch from the bottom (the green parts). Do the same with the zucchini except cut into diagonal strips (about 3 to 3 1/2 inches long and 1/2-inch thick). Place all of the veggies into a resealable plastic bag. Combine marinade ingredients in a small bowl. Whisk to combine and taste for salt content. Adjust to your preference. Remove 1 1/2 tablespoons of marinade and place into another bowl. This will be used for the artichoke. Add remaining marinade to vegetables in bag. Seal and carefully move vegetables around to evenly coat with marinade. Place into refrigerator for 20 to 30 minutes. While the vegetables are marinating. Bring 4 to 5 cups of water to boil in a medium pot. Cut the pointed tops off of artichokes and any pointed leaves around the perimeter. Cut in half and using a small spoon, carefully scrape away any fuzzy bits on the interior of artichoke. Once water has come to a boil, place artichokes into the pot. Boil for 5 minutes only. Promptly remove and place onto a clean dish towel or several layers of paper towels. Using tongs, carefully rotate them to remove any excess water trapped between the layers. Let cool for 10 minutes. If the carrots being used are large, then use this same par-boiling method. Let them cool and brush with marinade. Make sure to adjust for this by reserving more marinade. Once the grill has reached the right cooking temperature, oil the grill grates using a large pair of tongs, folded paper towels, and oil. Dunk paper towel in oil and wipe across grill grates several times to create a non-stick cooking surface. Brush reserved marinade onto the cut side of artichoke and place them onto the grill cut side down. Add the remaining vegetables to the grill and cook for a total of 8 to 10 minutes, carefully turning one to two times during cooking process. Once cooked through, vegetables should be tender but not too mushy. Place onto a platter, drizzle with fresh lemon juice and serve immediately.